They both used personal emails but approached it differently. Former Secretary of State Colin Powell has spoken out against claims that his email use in some way excused the way in which Hillary Clinton handled her email while she was secretary of state. "Her people have been trying to pin it on me," Powell told People at an event in the Hamptons in New York this weekend. "The truth is, she was using [the private email server] for a year before I sent her a memo telling her what I did," he told the magazine. It is unclear exactly when Clinton started using her personal email server, but the Inspector General's report states that she "employed a personal email system to conduct business during her tenure in the United States Senate and her 2008 presidential campaign." Clinton started serving as a senator for New York in January 2001 and started working as President Barack Obama's secretary of state in January 2009. Powell's comments come after portions of Clinton's interview with the FBI over her email practices were released to Congress last week. In the FBI notes, The New York Times reported, Clinton alleged that Powell advised her to use a private email account and that in 2009 he emailed her about his email practices at the State Department but by that point she was already using her own server. 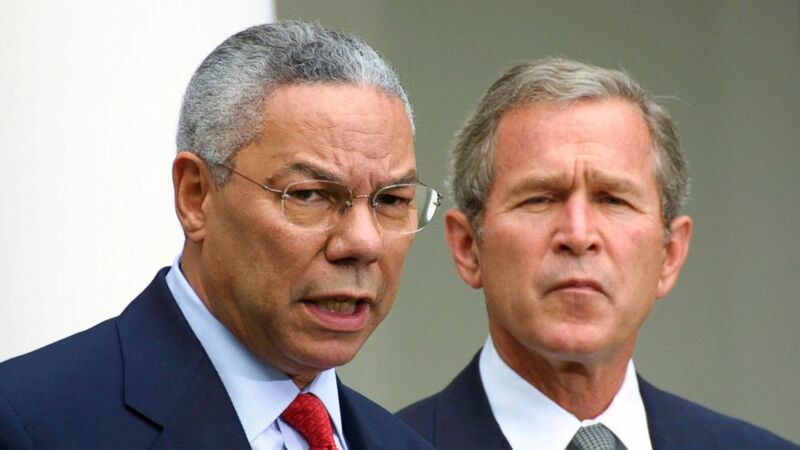 (David Hume Kennerly/Getty Images) Secretary of State Colin Powell speaks during a press conference on terrorism with President George W. Bush, Sept. 24, 2001, in the Rose Garden at the White House, in Washington. In a yet-to-be-released book about former President Bill Clinton's post-presidency, author Joe Conason writes that former Secretary of State Madeleine Albright held a dinner party for former secretaries of state in the early months of Hillary Clinton's tenure and Albright asked the other guests to give Clinton one piece of advice. "Powell told her to use her own email, as he had done, except for classified communications, which he had sent and received via a State Department computer," Conason writes, according to The Times. Powell's team did not confirm that version of events. "Gen. Powell has no recollection of the dinner conversation," his office said in a statement to NBC News on Friday. "He did write former Secretary Clinton an email memo describing his use of his personal AOL email account for unclassified messages and how it vastly improved communications within the State Department," the statement reads. "At the time there was no equivalent system within the department. He used a secure State [Department] computer on his desk to manage classified information." Republican National Committee Chairman Reince Priebus released a statement after the reports, saying that Clinton's team was "falsely trying to pin her email woes on Colin Powell, raising serious questions about whether she lied to the FBI." 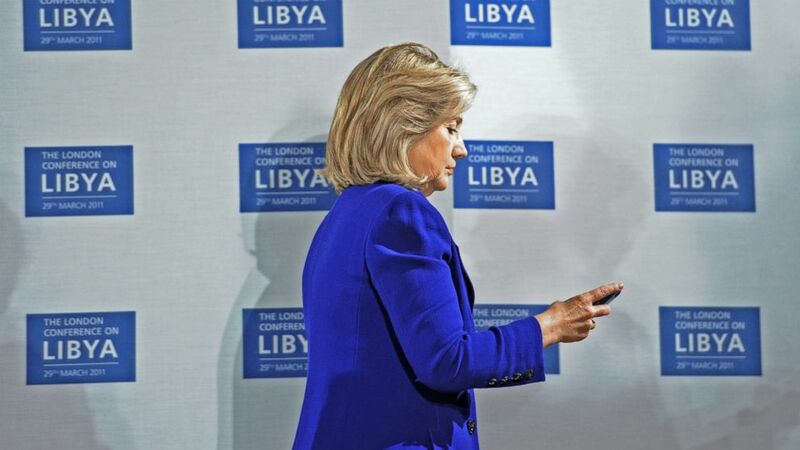 (Stefan Rousseau/WPA Pool/Getty Images) U.S. Secretary of State Hillary Clinton checks her phone at the opening of the Libyan Conference, a meeting of international allies to discuss the next steps for Libya, on March 29, 2011, in London. This is not the first time Powell has spoken about his email usage while in President George W. Bush's Cabinet from 2001 to 2005. Powell, as well as his predecessor Madeleine Albright and his successor Condoleezza Rice all met with the Office of the Inspector General during its investigation. Neither Albright nor Rice used "a personal email account to conduct official business," according to the Inspector General's report, even though Rice's term in office happened after Powell's. Powell's and Clinton's use of personal email — and the systems that they set up — differed. The Inspector General's report cites an explanation from Powell's autobiography, in which he writes that he "installed a computer on a private line" that was used for his personal email account, which he used to send messages to "principal assistants, individual ambassadors and foreign minister colleagues." In an interview on ABC News' "This Week" in March 2015, Powell told George Stephanopoulos that while he didn't store any of his emails, "in fact, a lot of the emails that came out of my personal account went into the State Department system. They were addressed to State Department employees and the State.gov domain. But I don't know if the servers the State Department captured those or not." The biggest difference between Powell's and Clinton's usage was that she had a completely separate server to house and store her emails, whereas Powell used only a separate email account.